I figured this was the best section for this post. If it's not, I apologize and can repost it where it is appropriate. This is something that's been occupying my thoughts for a while. Off and on, I've been looking at datasheets, jotting down notes, doing bits of math and generally mulling things over. I figured it would help to put my thoughts down in writing where people smarter and more experienced than myself can off their input and comment if they want. The point of this isn't try to prove how the valve sound or solid state sound is inherently superior or more desirable, but focusing more on why they are different and assuming one wants to accurately replicate a valve sound with solid state parts, how that might be achieved. I know this has been discussed before, if not here, then plenty times elsewhere. It probably sounds like I'm about to start beating a dead horse and parroting the same out-of-context half-truths that abound on the Internets. For that, I apologize. I'm only posting this because I've made a few observations I believe haven't been discussed to death. Though I warn I may still ramble a bit. So there's two tube types commonly used in guitar amps, triodes and pentodes. Pentodes are commonly used in the output stage for their greater capabilities. Triodes are commonly used in the preamp. There's exceptions, but that's the norm. Both are voltage-controlled - no appreciable amount of current in the control grid during normal operation. In fact, current on the control grid is a bad thing unless you like a hard, sudden clipping on the positive swing of your signal (Makes for a great crunchy distortion! ). You probably knew that already. There's two main types of transistors, BJTs and FETs. FETs are like tubes in that they're voltage-controlled devices. I don't know that any appreciable current flows in the gate in a JFET during normal operation, and I can't see how current can flow at all in a MOSFT, what with that insulated gate and all. Bipolar transistors however work with current. It's the changes in the current from the emitter to base that causes changes in the current from emitter to collector. Again you knew probably already knew that. Transistors and pentodes have similar output characteristics. Look at the graphs in the datasheet for your favorite BJT, FET and pentodes. The curves have a very similar shape. They all sprout up from 0V/0I, shoot up sharply, then bend sharply or softly after a small portion of the max voltage and swing almost horizontal. So we have a SS equivilent of the pentode -- the FET. Cool. Of note is how the curves are mostly horizontal after a small fraction of the output voltage. After the knee of each curve, a change in input voltage is going to affect more change in output current than it will in output voltage -- a low internal output resitance. That's why a pentode makes for as such a great output tube, poor damping characteristics of a low output resistance notwithstanding. A huge voltage swing is nice, but without current capability to back up that voltage swing, getting some decent output wattage and driving a loudspeaker is gonna be harder. So high current capability is desirable on the output of the amp, but what about on the input of the amp, in the preamp? Here we want voltage gain and lots of it. The output signal of a guitar pickup is of so little current and voltage that it doesn't take much attenuation to kill it entirely. give a .1Vp guitar signal a gain of 100, and now we a have a voltage swing that's much easier to work with. We can play with its frequency content to make it sound prettier, compress it so it's levels are more even and easier to work with, clip it for some crunchy sounds, and bring the voltage swing up high enough that with some current behind it a la the power amp/output section, can drive a loudspeaker. Yes, that's nice Koreth, congrats on finally getting guitar amps 101. Now go put your newfound understanding to use and go build a Noisy Cricket already. Do you have a point, or are you just rambling? Yes there's a point. We need voltage gain in our guitar preamp. Enter the triode. The curves for the output characteristics of a triode stretch more vertical than they do horizontal. A change in input voltage gives more voltage swing than current swing. Yes, a pentode can be made with with far more gain than a triode (the upper limit for a triode is about 100µ, pentodes can get over 1000µ.) But a pentode also costs more, is more prone to noise and microphonics (more active elements to go wrong). and requires a more complex circuit. We don't need a gain of 1000+µ in our preamp, plus noise and microphonics are Bad Things™ in a preamp. So if we could use a tube that requires less external parts, gives us the gain we need, isn't as prone to noise and microphonics, and on top of all that, costs less to boot, why wouldn't we? I suspect this is why the triode is the common preamp tube. It could also be that everyone is simply copying Leo Fender, and Leo was simply copying the RCA handbook, but that's another discussion. The point being is that unlike the pentode and his SS brother, the FET, there is no SS analogue of the triode. Maybe the Trioderizer counts. (http://radiomuseum.org/forum/the_trioderizer_a_solid_state_triode.html). Put some local negative feedback on a MOSFET and it starts to behave much more like a triode than a pentode (the SS verson of Ultralinear mode maybe?) But with only 10 hits on Google, either nobody cares, or there must be some fundamental problem with it that keeps it from seeing more widespread use in SS designs trying to cop a valve sound. So without a SS equivalent to the triode, where do we get our voltage gain for our preamps? I see opamps in a lot of schematics. Op Amps are great for the application. They have downright stupid amounts of gain available, so much we have to use local negative feedback to get the gain down to a useful level. Problem being is that especially with all that negative feedback improving it's operating characteristic, an Op Amp is really linear across the range of audio frequencies, AFAIK. But linear is good! We want linear! Harmonic Distortion BAD! Yes, and all this linearity is probably why a not insignificant portion of the guitar playing populace prefer tube amps to SS amps. An SS amp can be too accurate. The mysticism and some sort of placebo effect surrounding tubes aside, their imperfections apparently can color and distort the sound of a guitar in a pleasing way for some people. Great, it's two in the morning I'm tired and just realized I've just spent over a thousand words running in a giant circle without coming to a point. There's one, I promise. I'll post it later when I'm rested. It involves the nonlinearities of a triode. People smarter than me are welcome to point and laugh at the rambling newb now. What I see as having great importance in what you say, is that there's no "magic", "Mojo" or whatever involved. Parts is parts, active or passive, and "do things", each in its own way. Tubes do certain things that we like. I guess that if we can pinpoint them and get them through clever SS circuitry, our ears won't know (or care) about *how* we did it. The field for experiments is huge and open. Download and read Teemu's book. It's excellent (and unique, so far) and addresses some of the things you post. Thank you. I have read Teemu's book and attempted to read it. It's a hefty read in some parts, and as such, I've mostly only skimmed it thus far, but I agree, it is a good book. So I promised to make a point about the nonlinearities of a triode. Such non-linearities are present in all tubes used in guitar amps, really, and I think it is safe to assume, all tubes. The above graph of output characteristics given for a pentode was for a 6L6GC. Here's a KT88, used in output stage of the Ampeg SVT, and a few other amps. Here's an EL34, used in many popular Marshall designs. Here's the EL84/6BQ5, used in the renowned VOX AC30, and many other designs. And I couldn't quickly find a graph for the 6V6GT, used in many lower output Fenders, but I can assure you it follows the same pattern. I do realize that the 6L6GC and 6V6GT are considered beam tetrodes and only the EL84 and EL34 are "true" pentodes. Fair enough. The operation characteristics of a pentode and beam tetrode are slightly different and this may account for part of the difference in sound between a 6L6 amp and an EL34 amp, but functionally, they serve the same purpose and will be considered functionally the same for now. One thing I want to point out is the spacing of the input voltage curves. Towards the bottom of the graph, the curves bunch up and get closer together. Towards the top of the graph they spread apart. FETs do this too, but it is not as pronounced, IMO. Neither a pentode or a FET are the perfect, ideal component that is easily described mathematically, but tubes are far less so. The curves on a triode do the same thing, as seen in this plate characteristics graph for a 12AX7 triode, one of, if not the most commonly used tube in guitar preamps. Well that's nice, but what does this mean? This means, that the gain of the tube, pentode or triode, changes during operation, depending on what point it is operating at at any one instant. When the signal inside a tube swings positive, gain goes up until the tube maxes out and clips, and when the signal swings negative, gain is reduced until the cuts off and clips. Notwithstanding negative feedback or any other tricks applied to a tube gain stage to make it more linear, any signal fed into the tube, no matter how perfectly symmetrical and balanced will not come out as perfect. It's like we have a compressor on one side of the signal and an expander on the other, playing tug-of-war with the signal. Furthermore, this change in gain as the signal swings from one end of the graph to another in itself isn't linear. The closer the valve comes to clipping on the positive swing, the mroe quickly the gain ramps up. The more quickly the valve comes to clipping on the negative swing, the more quickly the gain goes down. To demonstrate this, I took the plate characteristics graph from a 12AX7 datsheet and plotted a load line for a 100k plate resistor, a B+ of 300V, and "center biased" with the grid sitting idle at -1.5V -- an arrangement similar to that found in many Fender amps. I took note of what the plate voltage would be at each grid curve, figured the size of the out voltage swing for each .5V step of the grid and the resultant gain. The numbers are below. Vg is voltage at the grid. Va is voltage at the plate. DeltaV is the change in Va from it's previous value. Cutoff 3.75? 300.00 08.00 32.? AFAIK, nobody has attempted to replicate this nonlinear variable gain characteristic of a triode in a SS preamp circuit. For all I know, this characteristic may be unimportant when it comes to trying to get SS components to mimic the distortion. If nothing else, I think it would make for an interesting experiment to make an SS design with a preamp which mimics this specific characteristic of a tube, and compare it to an otherwise identical SS design that did not, and see if there was an audible difference. Perhaps an actual valve preamp that the SS design was mimicking would be a good comparison also. That behaviour you see, which in a simplified way can be described as "non-symmetrical-gain", will cause both halves of a sinewave to be amplified by a different amount, stretching the wave on one side, and compressing the other half. That *is* distortion by any definition, and we will find it causes even harmonics, one of the distinguishing characteristics of "tube sound". Mind you, you have to drive the tube hard for best results. A *few* SS designers have produced it on purpose. The undisputed King of SS tube emulation is Mr Pritchard, he emulates that and *many* other tube characteristics which most of us aren't even aware of. Get into his site, read about his patents, listen to the MP3s, they are amazing. Mind you: only Country and Classic Rock there, some Jazz, no Metal. I often say, jokingly, that he only forgot to emulate the sound of glass, and of spirally wound cathode heaters .... although I half expect to see some patent about that too. Some distortion pedals use asymmetrical diode chains, say one pointing one way, two the opposite one, towards the same goal. There's a discussion about it somewhere, don't remember if it was in R G Keen's site or on Aaron Nelson's. Some of that was covered in Teemu's book. Read it slowly, let it rest, read it again, google any point you find interesting, and so on. There's too much information in there. I've re-read it many times, and every time I find something new. Good luck with your readings. PS: our friend Phatt took another approach: most of his signal chain is SS, but smack in the middle of it he uses a (small) tube power amp , re-amplifiying it later, after some processing, to get the best of both worlds. Read around SSGuitar, you'll find a wealth of useful information here. I won't quibble with the technical analysis. But the original question was why do transistors and tubes sound different. Understanding how the circuits work will of course add to the understanding of this issue. But I would point out that the sound of an amp is a whole lot more than the tube or transistor curves. Those are DC characteristics. SO for example trying to fathom performance in an audio circuit, such things as inter-element capacitances and their effect will not show up in that graph. And other arcane parameters like response to transients won;t show up in the curves. Looking at the horsepower and torque curves won;t tell you what it feels like to drive a particular car, and reading the recipe won;t tell you what the meatloaf is going to taste like. I encourage you to continue your research, but caution that it won't be so simple as finding some numbers or a formula, or a set of curves to explain the dynamics of the compared systems. You can compare curves between some semiconductor and some tube, and you might see that they approximate each other. That is fine, you could then build a circuit around each, and probably get the sounds to approximate each other. But the devil is in the details. Approximating is not the same as each other. 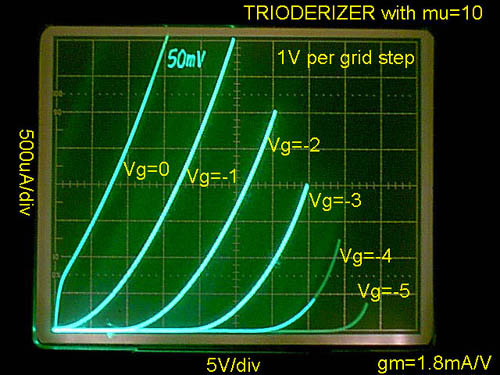 ...Well, there's this circuit that really is just negative feedback for a FET but some refer to it as "trioderizer". It pretty much estimates the characteristic tube curves too. Pritchard has also introduced many techniques to emulate the said characteristics and they are covered throughout his various patents. His circuits again offer close approximationa of triode-like transfer curves. He refers to the circuit as the XGPA triode. Here's a rough and very simplified sketch how it works. The "mystery component" Dx is a non-linear network that can have several forms. Here's few examples and their correspoding transfer curvers. I have studied a bunch of these circuits to discuss them in the second revision of my book... that I release who knows when. Anyway, the graphs you show are not unique to tubes. They are unique to tubes as devices but a complete solid-state circuit built to mimic such device can also possess similar transfer curves. Saturation effects are largely responsible for the "transistor sound". Both BJTs and JFETs suffer from this problem: when overdriven they tend to latch up for more than half of the cycle. The signal becomes mutated beyond recognition. MOSFETs sound better because they don't have this problem. My own attempt at a simple emulation (Vulcan) completely eliminates saturation but has the side-effect of early clipping on one side. Pushed output transformers are definately part of the "tube sound". This really shows up in professional tube amplifiers. The SVT Classic comes to mind, as well as a dimed JCM800. Raising the volume to 10 brings out a monster that wasn't there on 3. Hi joe , Yes Transformers ,, and in my somewhat limited research it would seem that the the most famous marshall sounds where likely due to *VERY LOW* Primary windings used with EL34 tubes. In my own testing I've found that a pair of 6V6 tubes driving the commonly excepted *Ideal* OT of say 6k6 primary was exessively harsh. and my god it was a real eyeopener, A night and day difference,, beyound my wildest expectaions. some tube geeks claim the just mismatching the *Secondaries* of high primary OT's will effect the same result but I have doubts about the maths involved. There was some good data on this subject over at *Obsolete Electronics* regarding the primary *match or mismatch* but that site is no longer in existance. All I will say with some certainty regarding OT's for tube amps is simply that It makes one HELL of a difference to the end result. As far as all the SS stuff goes a lot of it is beyound my ability,,, but ever so slowly I listern to chaps like you and I learn. If it is saturation effects in the output transformer that plays such a large role in the 'valve sound', than I can't help but wonder if one could reproduce some of these effects or similar effect by employing a transformer in an SS design. I know Teemu's book talks about some early SS designs that employed transformers, but that is largely unnecessary know, since SS devices have such an incredibly low output impedance. The impedance matching function an transformer serves in a valve design isn't needed to drive the speakers in a SS design. I wonder if one could work some transformer magic with an appropriately built 1:1 transformer between the output device(s) and the speaker. I'm pretty sure I'd want to be careful with impedance mismatches. Unless I'm misunderstanding data sheets for various SS devices, under-loading them is a great way to destroy them in a hurry. Another thing to add to the (growing ever longer) list of things to research and experiment with, I guess. It's good to find all this information. Today I've been reading the paper of Dimitri Danyuk "On triode Emulation", doing some math and trying to get the same graphics shown on the paper. (here is a link to the paper). I don't understand the last part, when Dimitri differentiates the double logarithm if the normaliced transfer function in order to obtain the exponent. BTW, Many people say that a JFET is much more alike to a triode than a MOSFET, but both share the same basic formula! There are differences, of course, like the capacitance or the lower noise, but apart from that, it's the same x^2 transfer funcion! This sounds like the theory behind the Fetzer Valve article on runoffgroove.com.I might play with the Fetzer Valve design using your figures for calculating Rs. It is indeed. As I don't just rely on "magic" numbers, I went to the source (Dimitri's paper) to check it Let us know if you find out something interesting with this k=0.64! BTW, JFETs are more like triodes than Enhancement MOSFET's, but not more triode like than depletion mode MOSFETs, which can be pushed into enhancement mode. And that shows that the main difference that makes JFETs "behave more like triodes" is that Vp is negative while in Enhancement MOSFETs Vth is positive. That's it, just an operating point detail! But you can see many people paying 50$ for a power JFET when you can use cheap power MOSFETs. I'd understand it if they said it was just because JFETs have less noise, but it's not the case... just another magic mojo thing! I know Teemu's book talks about some early SS designs that employed transformers, but that is largely unnecessary know, since SS devices have such an incredibly low output impedance. The impedance matching function an transformer serves in a valve design isn't needed to drive the speakers in a SS design. I wonder if one could work some transformer magic with an appropriately built 1:1 transformer between the output device(s) and the speaker. The transformer in a Valve Amp is a *voltage to current converter* ,,,So using a 1 to 1 OT with any SS design is likely not going to work as you might think. It would seem that the conversion done through a transformer maybe very different than a transistor circuit. Keep in mind that AFAIK transistors are generally *Low voltage, Low imp, High current devices*,,,whereas Tubes are Generally *High Volatge,, High imp,, *LOW Current devices*. My guess,,To even come close to approxamating a valve design output implies that you need to run the OT off the Collector/Drain,, not the emitter/Source. In most SS designs this is passed directly to the speaker. This is exactly what many of the early designs did. The topologies were direct copies from tube amps. Voltages were lower, though, and hence the turns ratios as well. - They increase the output impedance a lot and therefore affect the frequency response drastically. Not only are you driving the output in common emitter (or common drain) but also the device is limiting the amount of global negative feedback you can apply. - Limiting the amount of negative feedback also "delinearizes" the circuit and you get more distortion, earlier breakup and softer transition to full saturation. The long-tail pair differential input used by many amplifiers has very soft clipping characteristics but ironically this is usually hidden by the large amounts of used NFB. Reducing the NFB will accentuate this soft clipping characteristic. - You are likely converting the ouput amplifier from EF (with lots of degenerative feedback) to a CE amp. Now the load impedance will also affect the overall gain of the amp, furthermore accentuating the non-linear changes in frequency response. - The driving arrangement is usually very different. The push-pull circuit sums up the opposite phase drive signals and tends to correct and soften up the clipped waveforms. This doesn't happen in the generic Linn-style design. You can also easily add soft clipping to the driver amp. GMT's designs had the aforementioned LTP PI with soft saturation characteristics, Trace-Elliot amps used an OpAmp based PI (similar to Music Man amps) but fitted Zeners to their feedback loop. - Then there's the transformer's characteristics that limit the bandwidth. I personally don't put much value on the claims of "transformer saturation". It takes place well beyond the bandwidth of typical guitar amps and has hideous effects for the signal. More likely this supposed "saturation" efect people are hearing is due to decrease in overall negative feedback during clipping. Feedback extends the transformer's poor bandwidth. When the NFB becomes less effective the amplifier's bandwidth consequently reduces. So, drastic clipping will trigger a band-pass filter that softens up the clipped waveform. These are all issues that explain the "tube sound" - especially the "tube power amp sound". As they are much more related to the overall used circuit topologies, they apply equally to solid-state devices. Also, if you consider all these issues from the aspect of producing a perfect HiFi amp or a very high-power amp it's easy to see why designers abandoned or tried to get rid of pretty much all of those characteristics. They are good for distorted tones - yet, bad for pretty much everything else. Even the serious tube HiFi designs battled those issues in various ways. And then we have people comparing classic tube guitar amp designs based on all these characteristics to solid-state amps based on design principles that tried to achieve the complete opposite.